When the AR-15 rifle first made inroads into various civilian applications such as competitive shooting and varmint hunting, there were few solutions to the inherently terrible triggers that were found in these rifles. 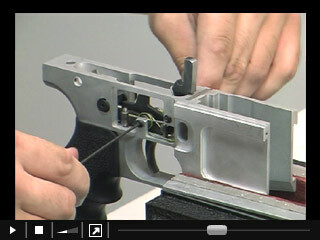 Typical stock triggers in AR-15 production rifles break at about 7-10 pounds with a yard of travel. (Or was that gravel?) Such triggers make serious accuracy “mission-impossible”. You’ve probably seen various attempts at trigger jobs onto AR-15 type rifles using screws through the receiver or welded on the trigger itself or actual set triggers like those used in black powder firearms. All these solutions have very limited success. Finally, a well known two stage trigger was introduced that did allow reliable function in these rifles and for years, the common wisdom dictated that only 2 stage triggers were a viable solution for the AR-15 rifle. However, for practical rifle competition and other field applications, a refined single stage trigger has the distinct advantage. Attempts to modify stock AR-15/M-16 fire control components nearly always end in failure. The sear geometry and metallurgy of the stock parts usually results in losing the sear edge and a trigger that doubles after a few hundred rounds. The JP single stage trigger is metallurgically improved and features engagement and over-travel adjustments in combination with completely re-engineered precision ground sear geometry, eliminating most of the hammer camming effect so prevalent with the original parts. Disconnector timing is corrected during the installation procedure, thereby eliminating the fire on release or “doubling” problem, when properly installed. The extremely short reset of the hammer ensures a durable relationship between the parts. The complete absence of take up and over-travel and incredibly short reset, makes this fire control system the best possible compromise between precision and speed for action or tactical rifle competition. Again, this system is the choice of many professional shooters—Bennie Cooley, Bruce Piatt, Tony Holmes, Don Bednorz, Taran Butler, Kyle Lamb, Tom Carpenter, Don Golembesky, Kurt Miller, and many other pro level shooters compete with JP rifles or rifles equipped with a JP Fire Control System. Many well-known custom gunsmiths recommend JP components. Six other major manufacturers of these rifles use JP components in their fire control groups. What more can we say? The original JP Fire Control System has become the benchmark of single stage triggers. At less than $100, the original JP trigger kit (JPFC-1 or 2) offers the best value on the market with the most improvement for the dollar of any competing aftermarket trigger system. There are several options in terms of installing the original JP trigger system, depending on how far you want to go with the parts and how refined you need to be. The basic package included the trigger, disconnector and spring sets needed to create either a recreational/competition or tactical set up using your original hammer and pins. Also included in all kits are a detailed instruction booklet and a complete instructional video. If you have a reasonable mechanical aptitude, you will be able to install the original JP Fire Control System as thousands have. If you’d like to take the system to the next level, add the JP Speed Hammer for the fastest lock time possible. Faster lock time equates into improved accuracy on precision rifles used as “SPR” or special purpose rifles. Finally, you may decide on the complete fire control package including the trigger, speed hammer and over-sized pins. The JP over-sized pins are the icing on the cake. We’re obviously trigger fanatics and the improvement of having slightly over-sized pins which perfect alignment of the sear/hammer relationship and eliminate the elliptical movement of the parts when captured by the standard (undersized) pins is a noticeable improvement for many. All JP rifles are built with these pins for a perfect glass-rod break to the trigger. If you do not feel mechanically inclined or just don’t have the time, send us your lower receiver assembly and we will install the system for you and turn it around in only one week at a nominal fee. No need to wait for months for some other trigger system that will not feel as refined as the JP system and cost considerably more. We offer four different spring set ups as listed below by application. Note that all JPFC kits now include both the yellow and red hammer springs which will allow for either 3-3.5 pound recreational/competition set up or the 3.5-4 pound tactical set up (#1 and #2 below). The red hammer spring is the minimum recommended for any military type ammunition which has low sensitivity primers and requires higher hammer velocity for full ignition reliability. 3-3.5 pound trigger pull for competition/recreational use. Kit includes yellow color coded trigger and hammer spring. 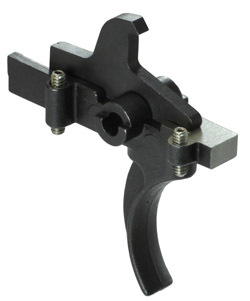 3.5-4.0 pound trigger pull for enhanced reliability and provides good ignition reliability with any ammo. The red hammer spring with yellow trigger spring is also the minimum required for a 308 AR-10 set up. 4-4.5 pound for police duty, military or any application in which 100% ignition reliability is demanded with low sensitivity primers or a heavier release is demanded by LE department requirements. May also be used for 308 AR-10 set ups. Kit includes grey hammer spring with yellow trigger spring.